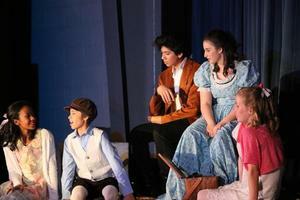 AC Musical Chitty Chitty Bang Bang, Jr.
On January 25, 26 and 27 the Gym was filled with the sounds of song and laughter as many SCM families and friends gathered to support this year's AC Musical, Chitty Chitty Bang Bang Jr. The Adolescent Community will host their annual Pancake Breakfast at school on Saturday, February 16 after Steps 4 Students. Reenrollment is due February 11 and New Student Applications are due February 14. If you would like to apply for consideration in the first round of the Archdiocesan scholarship fund, please complete the FACTS application by Monday, February 11, 2019. If you often find yourself wanting to revisit a past issue of The Globe, but dread the task of scrolling through a sea of old emails, we’re here to help you out! The Globe is now available online. This week, the Adolescent Community participated in a three-day spiritual retreat at Camp Kappe in Plantersville, TX. 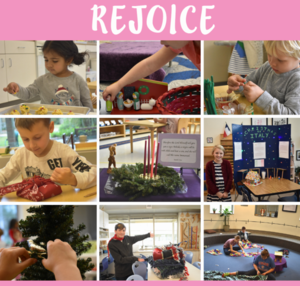 Last Sunday marked the third Sunday of Advent – the season preceding the celebration of Christmas, during which we prepare for the birth of Jesus Christ. The third Sunday, also known as “Gaudete Sunday” or “Joy Sunday”, is a day of rejoicing, and marks the halfway mark to Christmas. 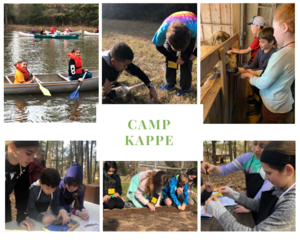 On Tuesday, December 12, Ms. Maggie and Mr. Tim’s classes departed for Camp Kappe’s School of Environmental Education (S.E.E.) in Plantersville, TX. 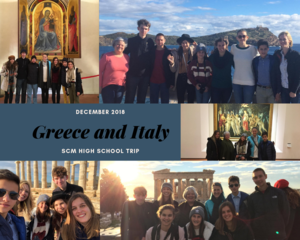 In their own words, the SCM High School students take time to reflect upon the preparation, study and hard work to develop a trip that further enhanced their Classical Civilizations studies this semester. 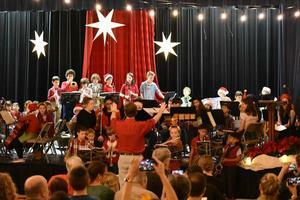 On November 30, the SCM community gathered for an evening of music and cheer at the annual Book Fair Christmas Concert and the final day of the Scholastic Book Fair.